On Friday, our summer reading academy participants were encouraged to dress up as super heroes. Ask are receiving Lindamood-Bell Seeing Stars or Visualizing and Verbalizing interventions. We're in the midst of our annual summer reading academy. At the end of the school year, forty-five lucky readers were identified to receive summer intervention services provided by highly trained staff. Our annual summer reading academy is just one part of our intense focus on early literacy, supported by a three-year Colorado Early Literacy Grant and annual READ Act proceeds. Just this week we were notified by the Colorado Department of Education that all three goals required to receive our third year of funding were met during the 17-18 school year. This is the result of hard work by our staff and students in McKinley Elementary, Lincoln School of Science and Technology, Harrison School, and Washington Elementary. Goal #1 was to make above to well above average progress moving students from the Well Below Benchmark category as measured by the DIBELS reading assessment. Across the district, we reduced our grade K-3 students performing well below benchmark from 33% at the beginning of the year to only 10% by the end of the year. Harrison School led the way in this category with a reduction in below benchmark performance from 34% to 10%. Brenna Angelo-Surber, Ryan Surber, Denise Barragan, Chris Hudson, Zach Strickler, Faith Daly, Nicole Bechtel, Eric Bechtel, CJ Richards had important roles in Les Miserables. The final scene of the first act of Les Miserables. 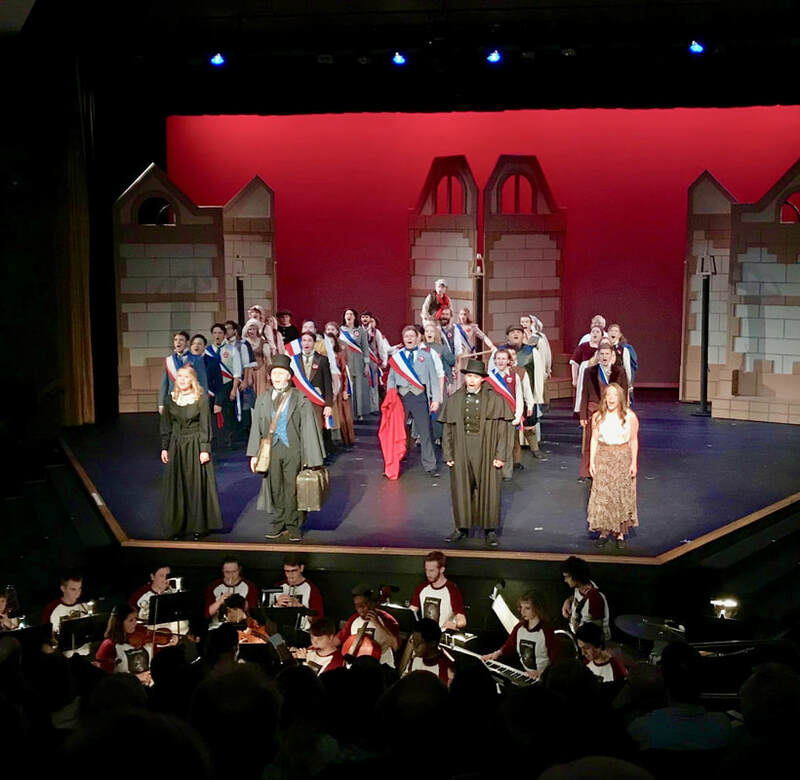 Each summer a musical is performed in Pueblo involving regional high school students. Literacy team members Kelly Jones, Lacey Ledoux, Jessica Stevens, and Jessica Bray (shown here with Melissa Garner from Lindamood-Bell) have guides many improvements in reading instruction at the K-5 level. Goal #2 was to make above to well above average progress moving students into the Benchmark category as measured by DIBELS. Across the district, we increased grade K-3 student reading performance to Benchmark from 53% at the beginning of the year to 71% by the end of the year. Washington Elementary led the way in this category with an increase in Benchmark performance from 49% to 74%. Goal #3 was to move 50% of students scoring Below or Well Below Benchmark up at least one performance category. Across the district, of the 169 students who began the year Well Below Benchmark 126 moved up, and of the 83 students who began the year Below Benchmark 77 moved up. Harrison School led the district in this category, moving 85.5% of their students up at least one category. This represents outstanding work by our literacy team, our title, special education, and regular education teachers, our instructional paraprofessionals, and our kiddos! On another front, last week nine current and former Cañon City Schools students played significant roles in Pueblo's annual summer musical. This year's show was Les Miserables. Brenna Angelo-Surber, Ryan Surber, Denise Barragan, Chris Hudson, Zach Strickler, Faith Daly, Nicole Bechtel, and Eric Bechtel all had important roles in the show. Additionally, Christopher "CJ" Richards blew the audience away with his outstanding rendition of Jean Valjean, showing amazing range in his vocals. These young men and women certainly represented the Cañon City Community and our schools well! For the past several weeks we have been pre-registering students for the coming school year at the district administrative office. On Monday, school office staff personnel will return to work to begin preparing buildings for the first day of students. Next week registration will shift to each of our school sites. Cañon City Middle School was well represented on our tour of new schools. Late Monday and Tuesday Brandy Price, Brian Zamarripa, Cortney Richardson, Jeff Peterson, Phyllis Pollard, Kelly Jones, Jesse Oliver, Karen Rogers, Stacy Murphy, Dee Leonhardt, Stephanie Day, Tim Renn, and Paula Buser and I traveled to Aurora, Denver, Arvada, and Boulder to tour some brand new school buildings. We are doing this work to prepare for our upcoming Washington and CCMS design process. 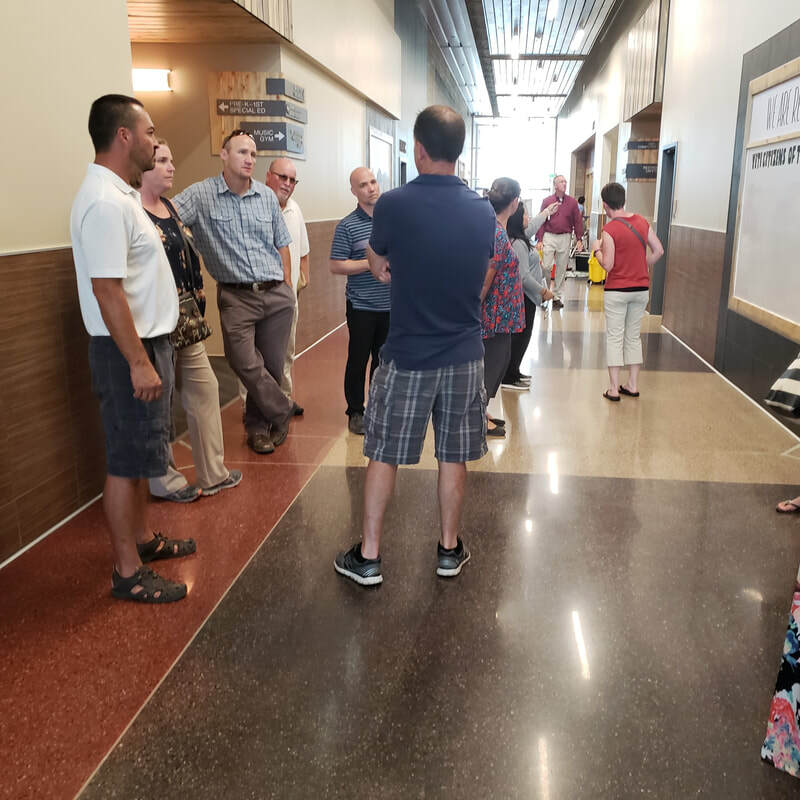 While on the tour we took special note of school entries and security efforts, types of flooring that are now available, wall surfaces, bathroom floors, walls, and fixtures, use of commons areas, gymnasiums, and stages, instructional spaces, and how students flow through facilities. We hope this work will better prepare us for our upcoming design process. After deciding in October 2016 to pursue a solution for the school's structural issues on its current property, we engaged architects and builders and concluded the cost to renovate the existing facility would be in the neighborhood of 70% of building a new one. With this in mind, we sought other routes to a solution. Our first step was to determine if we could construct a new school on the site, and we discovered that to be entirely feasible. Things we took into consideration are as follows: We can orient a two-story facility on the eastern portion of the property with a south facing main entry increasing safe access during winter weather. A two-story facility also creates operations efficiencies and allows us to make use of current utility access. It also allows for more parking and green space than is afforded by our existing facility. Cafeteria stool seating and . . .
polished concrete floors were of particular interest. Mr. Oliver samples a student standing desk. We can locate playfields to the west of the new facility allowing for safe and secure access as well as adequate supervision of children. We can orient a student drop off-visitor parking area off 10th Street to the east of the facility. At the time we applied for our grant, Canon City planners seemed quite favorable to this because it would remove traffic from more congested streets like College Avenue and 9th Street during student drop off and pick-up times. We can place a staff/visitor parking lot to the south and west of the facility with access to 9th Street, removing parking on busy streets on a daily basis, and during large scale school events. Our plan is to encourage community use of the facility when school is not session. There will be easy access after-hours by recreation programs, community arts programs, and Kids Klub patrons. Though we'll lose a valued traditional-style auditorium, our plan is to will allow flexible use of a commons-gymnasium area for public performances in an auditorium-like setting. We’ll locate these near the main entry of the building to encourage community use and interaction in a controlled manner, and to remove parking for such events from the streets. Our master plan supports a variety of learning activities with state-of-the-art classrooms that integrate instructional technology, breakout spaces, and small and large group instruction rooms. We’ll try to locate the media center, art room, commons, and gymnasium for easy access by each learning community. We’ll establish an east to west building orientation for classrooms to support effective morning and afternoon daylighting strategies, saving on energy consumption. Since Canon City is the Climate Capital of Colorado, transitional indoor-outdoor learning spaces are planned to take advantage. These will be located toward the center of the property, keeping noise levels away from the surrounding neighborhood, and kids safe. We’ll also erect brand new grade level appropriate playgrounds that will be open to the surrounding community when school is not in session. 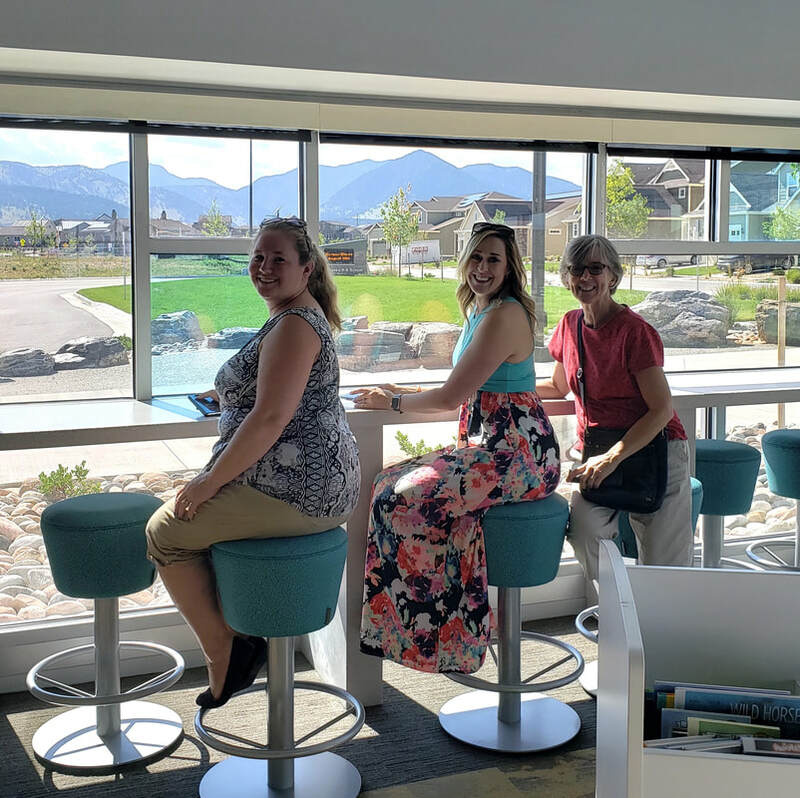 On Monday and Tuesday, I toured 8 new school buildings in the Denver-Boulder area with a team of CCSD staff in preparation for our building design process. On Wednesday through Friday, I spent quite a bit of time in the office attending meetings, working on personnel matters, and writing back to school communications. Doug Abernathy (center) of RTA will be our primary architectural partner as we begin our new building design phase. On Monday I'll attend school office staff back to school training, and I'll attend a board work session and regular meeting in the evening. On Tuesday we have a weekly Superintendent Advisory Council meeting, a weekly construction progress meeting, and I'll travel to Colorado Springs to meet with Wendy Birhanzel and Ted Knight, two of the external experts we bring in to review the academic progress of our schools. On Wednesday I'll attend a Colorado Education Initiative Assessment for Learning Program meeting. I'll then be traveling on Thursday and Friday to attend a family wedding over the weekend in Tucson, Arizona.